Thanks for the nice addon. I ran into a problem and I'm wondering if there's a fix for it. I use Wordpress to make sites and your addon keeps adding code when I'm editing pages. If I select any text while using the visual view in the editor, it adds code that can only be seen using the code view in the editor. Is there a way of stopping it from doing this? Sharcs wrote: I use Wordpress to make sites and your addon keeps adding code when I'm editing pages. Hey, how do i disable the buttons (tool tips) that pop up every time when selecting text? They are really annoying and i cant find an option for it. Sorry if this has been asked already. LindBind wrote: Hey, how do i disable the buttons (tool tips) that pop up every time when selecting text? They are really annoying and i cant find an option for it. I have one recommendation about a best feature. Putting the mouse on the word, then use hotkey (ex: alt+v) to translate the word or the url link. rfrkk wrote: Putting the mouse on the word, then use hotkey (ex: alt+v) to translate the word or the url link. 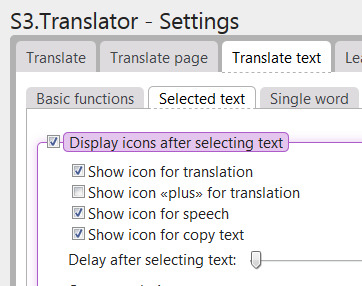 Please consider adding dictionary definitions for single-word translations; in addition, an "alternate" language option instead of the "Disable when the language of the site matches the language of translation" option. That is, a second target language: If the detected language matches the first target language, then translate it to the second target language. "Long press" feature is tremendously useful and most of my action is using this feature. But this feature doesn't work just after moving to a previous or a next page by back or forward button (or Alt+arrrow-key). It begins to work only after F5 refresh. Is this avoided by some settings or some workarround? kaz4ikeda wrote: "Long press" feature is tremendously useful and most of my action is using this feature. "Long press" for translate single word?